The Chene des Hindres is one of the oldest oaks in the Forêt de Paimpont-Brocéliande. This forest, the setting of the Arthurian Legend, is located in the heart of Brittany. 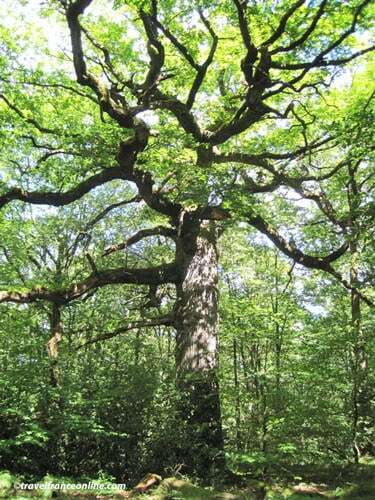 The Chene of Hindres is a 500-year old (or so) sessile oak (Quercus Petraea). Its dimensions are therefore quite impressive: 23m tall for a circumference of 5.07 m at 1.30 m above ground level. It grew on the site of an ancient ritual ground the druids once used for their ceremonies. The magnificent Chene des Hindres is nestled deep in the the heart of the Hindrés, as the locals call this enclave of the magical Forêt de Brocéliande. Therefore, you are only able to reach it by foot. You have to follow a farm track originating along the D59 (to Plélan-le-Grand) and turn left on a logging path that leads you in the deep of the forest. The Chene des Hindres is a stone's throw from the Tombeau de Merlin and the Fontaine de Jouvence. The many knots and convolutions of the bark tell you that the majestic Chene des Hindres is old, very old! Some locals will tell you that the fairies of Brocéliande used their magic wand to give the Chene des Hindres its longevity, so it could whisper the old legends. Its branches bend under the weight of years and the wind sometimes breaks some of them. An enclosure was therefore built in order to ensure its protection and the safety of the passers-by. 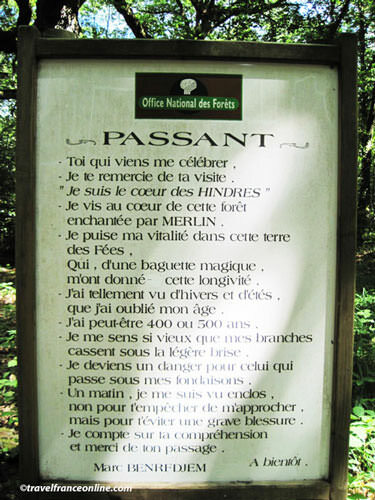 Visitors are welcomed with a lovely poem by Marc Benredjem, a technician of the ONF (Office Nationale des Forêts – National Forestry Office). Je vis au coeur de cette forêt enchantée par Merlin. Je puise ma vitalité dans cette terre des fées qui, d'une baguette magique, m'ont donné cette vitalité. J'ai tellement vu d'hivers et d'étés,que j'ai oublié mon âge. Je me sens si vieux que mes branches cassent sous la légère brise. Je deviens un danger pour ceux qui passent sous mes frondaisons. Un matin, je me suis vu enclos, non pour t'empêcher de m'approcher mais pour t'éviter une grave blessure. Je compte sur ta compréhension et merci de ton passage." "You come to pay me tribute - And I thank you for your visit. I am the heart of the Hindrés - I live in the heart of the magical forest of Merlin the Wizard. I draw my vitality from the soil of the fairies who blessed me with their wand. I have seen so many winters and summers that I have forgotten how old I was. I feel so old that my branches break in the breeze - I become a danger to those who walk under my foliage. One morning I discovered I was fenced, not to stop you from coming close but to protect you from a serious injury. I hope you will understand and I thank you for your visit." Directions: Follow the D2 from Concoret to Saint-Malon sur Mel, do a sharp right turn onto D59 before La Ville Moisan, then keep right to follow the D71. A few 100m farther along you'll find a farm track to your left, follow it until you find a small car park and continue by foot; the trail will take you into the forest. It's a bit tricky but look at the map below, and it will make sense!